Having trouble viewing this issue? Click here. Refer a Friend to Wealth Daily. It's the deadliest device ever invented... and if you were born in any Western country after 1967, you've been in its crosshairs for your entire life. The Soviets called it the R-36, but the U.S. codename for this missile was far more descriptive — both of its capabilities and of how it was viewed by the Pentagon and Department of Defense. They called it the SS-18 "Satan." By every figure and statistic, the Satan takes the concept of nuclear war to an extreme. 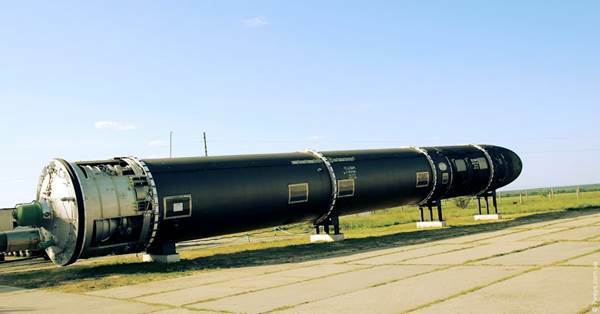 Its range is 10,000 miles — long enough for it to hit any target in the world from its silos in central Russia. It travels at 23 times the speed of sound and produces enough thrust to put satellites into orbit. It's the world's heaviest intercontinental ballistic missile, and it carries twice the payload of the biggest ballistic missile produced by the U.S. The reason for this size is simple: The multiple warheads it's designed to deliver are the biggest and most powerful ever mounted on a missile. A Princeton study confirms that a certain corner of the market is being shrouded in a veil of secrecy. The "powers that be" are hiding it because they don't want to split the money pie with you. This corner of the market hits, on average, for 45 price doubles every single day. Forty-five is just an average. The next 45 doubles are scheduled to occur tomorrow at exactly 9:30 AM EST. Click here for details. Carrying between one and 10 warheads, the Satan strikes its target with thermonuclear packages up to 20 megatons in yield. To those unfamiliar with how the destructive ability of nuclear weapons is measured, that's the equivalent of 20 million tons of TNT exploding above the target. Or for comparison's sake, that's 1,300 times the energy released over Hiroshima when the U.S. Air Force leveled it in history's first atomic attack on August 6, 1945. But they didn't stop at making it simply the most fearsome weapon ever; they made it smart, too. Despite their power, the Satan's independent warheads are also highly accurate — hitting, on average, within just 220 meters of their designated target. In intercontinental ballistic missile terms, that's as close to a sniper rifle as it comes. And it knows how to protect itself, too. SS-18 Satans come with their own countermeasure system — deploying as many as 40 decoy warheads to confuse anti-missile screens. Had it ever been used, the Satan would have likely been deployed to hit the biggest, most protected, most high-value targets possessed by Russian rivals. 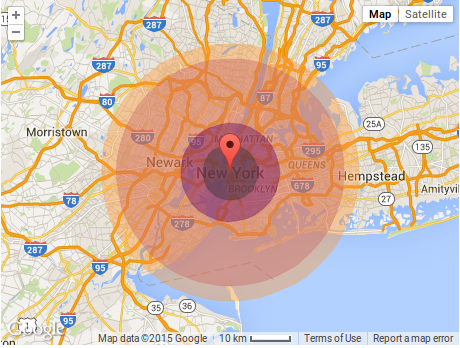 Cities like D.C., New York, and London would have been incinerated by overlapping detonations from Satan warheads, as would suburbs, infrastructure, and everything else within a 15-mile radius of the point of impact. In the diagram below, the dark red circle indicates an area where no buildings would remain standing. Anything inside the largest yellow ring would merely catch fire and burn — people and structures alike. And that's just one warhead. It's a good thing for humanity that these monsters were never used, because if they had been, it would have likely been the end... for everyone. Why Obama Really Hates Keystone! A "secret pipeline" that could be the answer to the nation's — and the world's — energy problems. And it could also make savvy investors rich in the process. But only if they see the exclusive details of his plan. Click here to see the plan... and how you can profit starting today. Although the SS-18 Satans are still deployed in limited number to this day, their most recent influence on the balance of global politics and power has been a surprising one. You see, for more than two decades, the SS-18s have been releasing a different kind of energy in the U.S. — a kind that doesn't come in a brilliant flash followed by a white-hot pressure wave, but rather the kind that heats homes, powers appliances, and turns the gears of industry. In 1991, the U.S. and Russia started one of the most peculiar and most successful collaborative programs between the superpowers since the Apollo-Soyuz Test Project of the mid-1970s. Called Megatons to Megawatts, the program involved taking decommissioned and aging nuclear warheads from the 30,000-plus stockpiled during the Soviet era and harvesting enriched uranium for civil usage. Russian uranium, once in the heart of weapons like the SS-18s, became fuel for American nuclear power plants. The process required 90% enriched Uranium-235 to be downgraded to 5% low-enriched uranium (LEU) through dilution — ultimately yielding about 30 times that mass in reactor-grade fuel. In total, the program took 500 metric tons of weaponized uranium out of circulation, and with good timing, as the post-Soviet 1990s saw a collapse in the organizational infrastructure that kept live warheads secure. Over its 20-year lifespan, Megatons to Megawatts accounted for up to 10% of the total energy used in the United States — or about half of the total power output of American nuclear power plants. It's a story few Americans know about and probably even fewer would have believed after the height of superpower rivalry in the 1980s, but it's a fact. Russian warheads have been powering our society for more than two decades, even while the two nations continued to view each other with suspicion and, at times, open hostility. However, all things come to an end. And in 2013, the program concluded. Given today's level of tension between the Kremlin and the White House, a renewal of this program is unrealistic, to say the least. The Russians are now building new warheads for new, smaller missiles, as well as using the uranium for their own civil projects and reactors. This means our two-decade-long free ride is over. We now have 61 nuclear power plants online and five under construction. In total, the plants operating now provide just under 20% of our total national energy supply. Globally, one-third of all nuclear-derived power is produced in the U.S. The question is, with such a thirst for nuclear power, how do we wean ourselves off Russian uranium? It's a question energy and financial analysts have been pondering since long before the program ended. It's definitely a question the federal government has an interest in on multiple levels. The only real answer, unfortunately, is that we have to get back into the uranium production business, and in a big way. And that's exactly what's happening right now at resource mining and production companies across the continent. 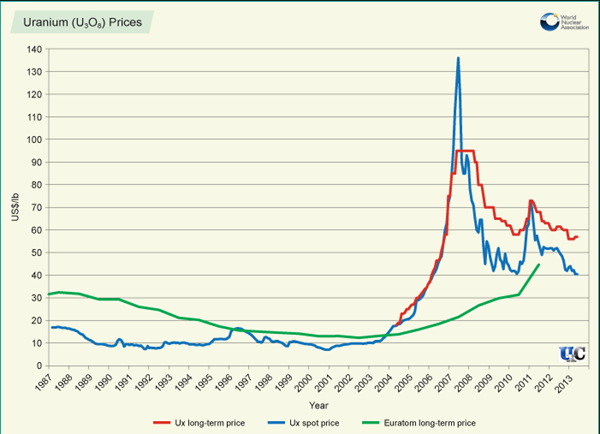 However, even as this tidal wave of demand for domestic production ramps up, uranium prices have still not recovered from the effects of the recession. Depressed prices and spiking demand. In the financial industry, when a resource's market value does not accurately reflect its true value, it's called an inefficiency. Inefficiencies usually do not last long. Sooner or later, market forces swing the pendulum in the opposite direction, and we get a spike in prices as investors realize what they've been missing and start piling in after the smart money. Vladimir Putin just gave Obama a firm middle finger. Two years ago, first in low whispers and then pounding the table with outrage, the United States financial world began discussing the possibility of a world-changing phenomenon. It was the end of the system that has vastly favored the U.S. dollar as the world's reserve currency. For over 40 years, oil was traded in U.S. dollars, which forced almost every country to buy U.S. debt. On June 9th, 2015, Russia, China, and Iran stopped. Goldman Sachs says this will impact everything from geopolitics to global capital flows to safe-haven status.